Lumex’s InfoVue™ Extreme Temp series of high-duty LCD displays are ideal for applications that perform in extreme heat or extreme cold. Previously LCDs that operated in extreme cold or extreme heat required bulky built-in heaters and coolers in order to ensure performance. However, the proprietary liquid crystal used in the InfoVue Extreme Temp series eliminates the need for coolers and allowing Lumex to use low-power heaters. 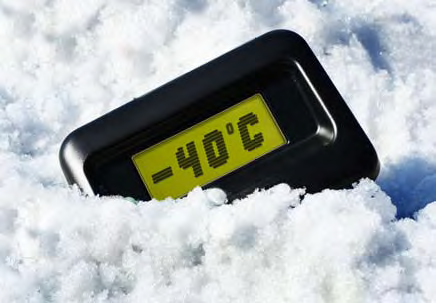 This makes the InfoVue Extreme Temp LCDs better able to perform in more hostile conditions. InfoVue Extreme Temp LCD displays provide reliable, consistent high-quality performance from -40°C to +85°C , making Lumex LCD technology a viable solution for a growing number of applications. The growing demand for high performance LCD technology can be seen in military, freezer, gas pumps/fuel meters, non-automotive transportation, and nonclimate controlled facility applications. Extreme Temp LCDs also offer significant visual performance benefits, providing full graphic capability and daylight visibility. When combined with LED backlighting technology, a wide range of color options are available. All InfoVue Extreme Temp LCDs are available with either a monochromatic screen with any color of LED backlight, or select negative image option with mono colored pixels and a black background. InfoVue Extreme Temp LCD displays can be produced in sizes ranging from 8 x 1 to 20 x 4 character displays and 128 x 64 to 320 x 240 pixel graphic displays. The list below provides an overview of the types of numeric LCD displays Lumex provides. In addition to our standard product offering, Lumex can also customize any LCD to suit your specific design needs.